Shaun Wane stopped short of blaming Widnes’ artificial pitch for the injury which will sideline Joe Burgess for the rest of the season. The winger injured his left anterior cruciate ligament (knee) in last Friday’s 34-24 win at Widnes and will sit out the remainder of the campaign, starting with tonight’s visit of Salford. 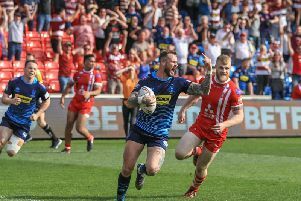 This is the third successive year Wane has last one of his players at the Vikings’ controversial ‘iPitch’, following Jake Shorrocks – who will play on loan for Salford tonight against his parent club – and Nick Gregson, who is now at Leigh. Asked if this was a coincidence, Wane said: “I don’t know but they are all the same injury. “We’ve had three shockers there, three wrecked knees. I don’t know whether it’s the pitch, or we’re just unlucky. I just don’t know how good the quality is. “Whether it’s just luck, I don’t know, I’m not qualified to say that. Wane didn’t want to risk Sam Tomkins and Ben Flower - who have both had knee problems in the past, and return to his side tonight. Tom Davies is also back in the team and will replace Burgess, who was hailed by Wane for his early-season form. “He’s done an outstanding job, in the last few games he’s been the best winger in the country,” he said. “I’m gutted for him. Asked how Burgess was coping, Wane replied: “He’s not so good, he’s gutted, he’s a young lad who naturally wants to play rugby and he’s had the full year taken out of him because of an unfortunate accident on a poor pitch. “I’m personally devastated for him. Wane said Dom Manfredi trained yesterday but expects him to be at least two months away from challenging for a place in the side. Manfredi has not played a senior match since the summer of 2016.